Even the prose a poet writes is poetry; for sure, that is true about Henri Cole’s latest book, Orphic Paris. The book pretends to be prose, but it is poetry carved in paragraphs. Cole is famous for writing sonnets without rhymes. Sonnets are limited to 140 syllables, but poetic paragraphs are much more flexible in size, rhyme, and syllables. Cole seems to be experimenting with form. The unique feature of Orphic Paris is its nifty layout. The book is composed of 17 (XVII) Parts identified with Roman numerals. Each Part consists of paragraphs, some separated by noticeable empty space; successive paragraphs may digress and venture into different thoughts, accounts, and matters. The continuity within each Part is deliberately broken; or, perhaps the other way around, diverse thoughts, accounts, and matters have been necklaced into a tenuous unity. Delivering crystal clarity, however, is rarely the objective of any poetry. Cole’s poetic paragraphs, written in an aphoristic style, intersected with bleary images, may lure some readers to folded fields of imagination. However, readers with poor patience or visual acuity may simply quit staring at the images to cull meaning and settle with only reading the paragraphs. Orphic Paris is dedicated to ma mere (to my mother). Cole’s mother was Armenian-French. “French is not my mother tongue,” says Cole, “though it is my mother’s tongue.” Cole writes in English only, though the book contains a few French words. Cole also knows a few words in Japanese (he was born in Japan where his father met his mother). Cole, now in his early sixties, is gay in sexual orientation. These personal facts are broached in paragraphs. Cole presents himself as “a worker bee beside other workers who are metabolizing language.” The metaphor of a bee, fluttering from flower to flower, gathering nectar, and turning the takings into honey is most appropriate in describing Orphic Paris. Cole borrows ideas and text-snippets from other poets and writers, commingles these takings with his own pollen to honeybunch poetic paragraphs. An analogous exercise in academic literature appears as copiously footnoted research that metabolizes the thought process as the footnotes furnish the honeycomb of academic interactivity. For example, Part IX begins with the French custom of visiting local cemeteries to celebrate living saints. Cole visits James Lord, not a saint but an American writer, buried in Montparnasse Cemetery. The paragraphs turn to memories of James, and through his writings, to the memories of Baudelaire, Giacometti, Picasso, Cezanne, and Alice B. Toklas. A picture shows James sitting on a white sofa, and a drawing of a “make-believe” flower that James sent to Cole in a letter. Part IX spanning over nine pages has a total of seven pictures. The readers may uncover connections in Part IX. They may infer that dead writers and painters are presented as living saints. Their memories and works give warmth in winter and company in loneliness. Leaving your own country and living in a foreign country is no different from leaving the Latin Quarters and living in “that garden of death.” Living alone could be as much non-optional as being dead. “I must remain alone,” writes Cezanne to his son, for “the meanness of people” is intolerable. A grave might not be as bad as “a small apartment in an ugly modern building.” These thoughts ebb and flow as the reader looks for thematic unity. Cole is equally innovative in comparing more complex processes. For example, “I resemble a packer bee, striving to put enough pressure on language to transform it into poetry, regurgitating my nectar again and again until honey is formed.” The comparison highlights that the craft of making honey is no different from the craft of writing poetry. Reading Orphic Paris could be a joy forever. Paris the city is stunning, and Orphic Paris the book is gorgeously written. 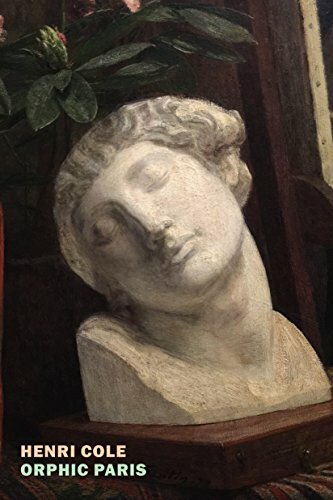 Without being ungrateful to the many beauties of Orphic Paris, some readers may question the fetishization of France in general and Paris in particular. France and Paris have been as ugly in history as have been other countries and cities. Art and poetry cannot hide murder and persecution. Even contemporary Paris is a complex fusion of splendor and alienation for residents, critics, aliens, and even tourists. Yet, except for blue-collar descriptions of his father, Cole seems to have transformed most autobiographical observations into patrician renderings. In reading Cole’s poetic prose, the aristocrats and others with superb taste in art and literature will feast on exquisite foods prepared by celebrated chefs. This book is for the bourgeoisie as conceived by Karl Marx. Some readers, the lesser connoisseurs of high arts, may not even know the various writers and artists connected to France or Paris and mentioned in various Parts. From page one, the book turns into an “elitist” presentation of autobiographical observations colored through the works of legendary painters and writers, devoted to seeing just charm and beauty. Beauty by association turns into a redemptive force for Cole to write the book. The readers of James Baldwin, who also moved to Paris and is once named in the book, will find little to connect with Orphic Paris. Baldwin had no problem loving without fetishization. He said, “I love America more than any other country in this world, and, exactly for this reason, I insist on the right to criticize her perpetually.” The lovers of Paris, like Cole, have little excuse not to see all corners of the city, beautiful and ugly. For some artists, including Cole, the search for just beauty is a noble undertaking. Artists must be free to pursue their calling, whatever it is. In Cole’s words, “there should be no stigma attached to (confessional poetry)” for any constraint on artistic freedom, even if it is exercised in inauthentic ways, is oppression. The artist ought to be the chooser. Yet truth must be told: Aristocratic artistry can easily segregate itself from the bidonvilles (slums) pitched around magnificent mansions. Aristocratic prose, produced by aristocrats themselves or their cheerleaders, which ignores the ordinary folks, has no claim on the attention of the ordinary, including much of America that has little fondness of any form of aristocracy. And so, Orphic Paris is a splendid contribution to the bourgeoisie literature.